Incumbent board members Christine Dickson, Diane Blair and Margaret Haynes were all sworn in for new terms. The Mt. 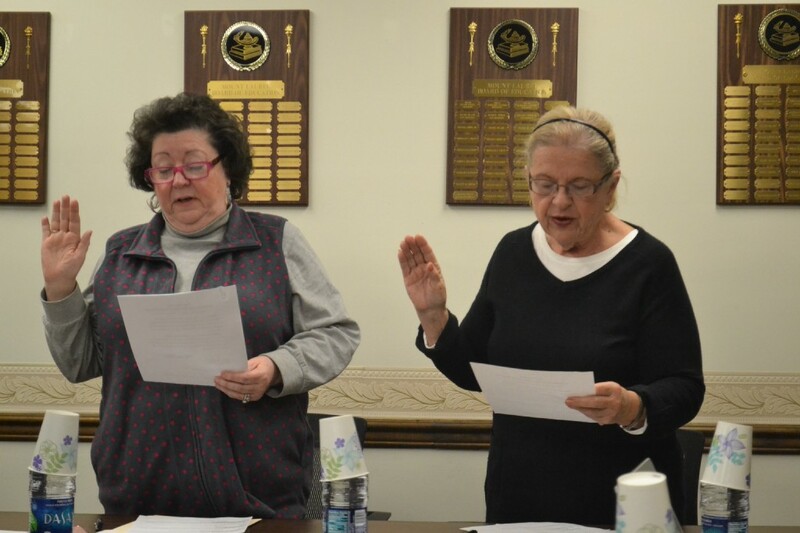 Laurel Schools Board of Education held its annual reorganization meeting this week, which featured the swearing in of re-elected BOE members Diane Blair, left, Margaret Haynes, right, and Christine Dickson (not pictured). The Mt. Laurel Schools Board of Education met briefly this week for its reorganization meeting for 2018. 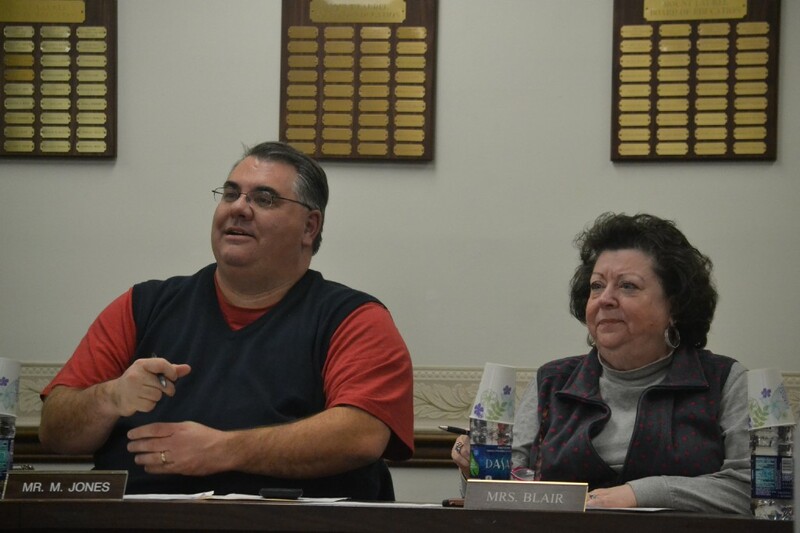 During the meeting, the three board members who ran unopposed in the November election were sworn in for their new, three-year terms. Board Secretary Robert Wachter Jr. read the results of the election into the record, noting that Christine Dickson received 7,389 votes, Diane Blair received 7,213 votes and Margaret Haynes received 7,155 votes. Remaining members of the board include Marc Jones, Melissa DeClementi, Leigh Ann Erlanger, Michael Gallagher, Margaret Haynes and Scott Jones. The board also once again selected board member Marc Jones as board president and Blair as vice president for 2018. Jones and Blair served in those roles last year, as the Mt. Laurel Schools BOE traditionally selects the same president and vice president for two consecutive years. This week’s Mt. Laurel Schools Board of Education reorganization meeting once again saw board member Marc Jones selected as board president and board member Diane Blair selected as vice president. Jones said he was excited to serve as the board’s president for another year. “I’m very honored to have been re-nominated and re-elected, and I’m excited about some the changes we’re putting through with the Path to Success (the board’s ongoing strategic planning initiative) that we’ve started, as well as moving forward with updating our schools as best we can in 2018,” Jones said. Blair also said she was excited and honored to have another year as the board’s vice president. “I appreciate the board’s confidence and the board’s support in me, and I’m also looking forward to all the things we’re going to do this year,” Blair said. The board also appointed its professionals for the year, including Frank P. Cavallo, Jr. of Parker McCay as board solicitor, Robert Muccilli of Capehart & Scatchard as board negotiator, Dr. William J. Mills of the Virtua Mt. Laurel Family Physicians as school physician and Henry Ludwigsen and Fred S. Caltabiano of Bowman & Company as district auditor. Wachter was also appointed to once again serve as board secretary and purchasing agent. Mt. 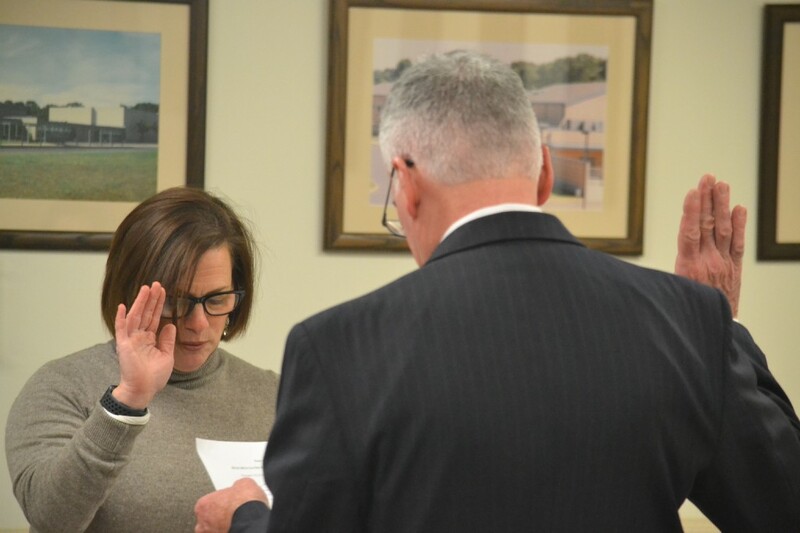 Laurel Schools Board of Education Secretary Robert Wachter Jr. swears in re-elected BOE member Christine Dickson at this week’s board reorganization meeting. The board approved its calendar of regular meetings for 2018. Regular meetings are scheduled to take place once a month on select Tuesday evenings starting at 7 p.m. Meetings for 2018 are scheduled for Jan. 23, Feb. 27, March 27, April 24, May 22, June 12, July 24, Aug. 21, Sept. 25, Oct. 16, Nov. 27 and Dec. 18. All meeting are scheduled to take place at the Mt. Laurel Schools Administrative Offices Building, located at 330 Mt. Laurel Road, except the May 22 meeting, which will take place at Hartford School at 397 Hartford Road. The board traditionally uses its May meeting to honor retiring staff and hand out additional awards, hence the change in the meeting’s location to Hartford School where more seating is available. Residents can learn of any cancellations or additions to that schedule in advance of the meetings on the school district’s website at www.mtlaurelschools.org.